Last post from Kitaab-ul-Jumu`ah [Book of Friday]. Alhamdulillah. Silq, the vegetable, is the beetroot (chiqandar). They used to offer Jumu`ah, then eat and then take the afternoon nap. Narrated by al-Tirmidhi, no. 380; classed as saheeh by al-Albaani in Saheeh al-Jaami’, 6362. Pray the Sunnah prayers at home (for men). Especially the 2 rak`aat after Jumu`ah. Prophet (SAW) never prayed after Jumu`ah till he departed from the Mosque. So make it a point. *Prophet (SAW) sometimes prayed these rak`aat, and sometimes he didn’t. The other Sunnah prayers were offered regularly by him. He never missed them unless an exceptional situation came up. To get some detail on this incident, read it in Tafsir Ibn Kathir. Whenever something went wrong, Prophet (SAW) corrected it, and/or Allah (SWT) sent down revelation regarding it. All such incidents have been recorded in the books of Ahadith and history. It’s a blessing for us, because we can derive great benefit from them. We must learn from these incidents, teach others and make sure not to repeat those mistakes again. We must never come to any conclusions before knowing the background or both sides of the coin, to be more precise. When in a halaqah of Quran/Hadith/knowledge, NEVER be distracted. It is Shaytaan who wants to distracts you and does not want any good to come to you. No matter what comes up, the knowledge you’re gaining in that halqah is far more better and way more important than any worldly thing. So FOCUS! Generalize this rule: focus on what you’re doing. What good is there in distraction after all? Obey Allah. 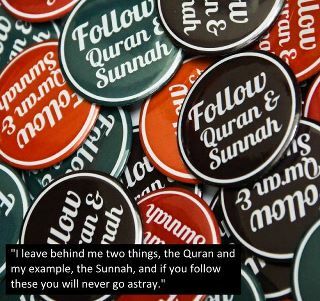 Follow the Sunnah. Be cool. when the Imaam sits on the pulpit until the end of the (Jumu`ah) prayer. after the `Asr prayer until the Maghrib prayer (most correct of the two opinions). Don't forget to share it with others! Ibn al-Qayyim (may Allaah have mercy on him) said: The most correct of these views are two which are mentioned in proven ahaadeeth, and one of them is more likely than the other. Al-Tirmidhi (490) and Ibn Maajah (1138) narrated from Katheer ibn ‘Abd-Allaah ibn ‘Amr ibn ‘Awf al-Muzani from his father from his grandfather that the Prophet (peace and blessings of Allaah be upon him) said: “On Friday there is an hour of the day during which no person asks Allaah for something but He will give it to him.” It was said, When is that time? He said, “When the iqaamah for prayer is given, until the prayer ends.” [Shaykh al-Albaani said: It is da’eef jiddan (very weak)]. The second view is that it is after ‘Asr, and this is the more correct of the two views. This is the view of ‘Abd-Allaah ibn Salaam, Abu Hurayrah, Imam Ahmad and others. The evidence for this view is the report narrated by Ahmad in his Musnad (7631) from Abu Sa’eed al-Khudri and Abu Hurayrah, that the Messenger of Allaah (peace and blessings of Allaah be upon him) said: “On Friday there is an hour when no Muslim happens to ask Allaah for good at that time but He will give it to him, and it is after ‘Asr.” [In Tahqeeq al-Musnad its says: The hadeeth is saheeh because of corroborating evidence, but this isnaad is da’eef (weak)]. Abu Dawood (1048) and al-Nasaa’i (1389) narrated from Jaabir ibn ‘Abd-Allaah that the Messenger of Allaah (peace and blessings of Allaah be upon him) said: “Friday is twelve hours in which there is no Muslim who asks Allaah for something but He will give it to him, so seek the last hour after ‘Asr.” [Classed as saheeh by al-Albaani]. Sa’eed ibn Mansoor narrated in his Sunan from Abu Salamah ibn ‘Abd al-Rahmaan that some of the companions of the Messenger of Allaah (peace and blessings of Allaah be upon him) gathered and spoke of the (special) hour on Friday, then they parted and did not disagree that it is the last hour on Friday. [al-Haafiz classed its isnaad as saheeh in al-Fath, 2/489]. 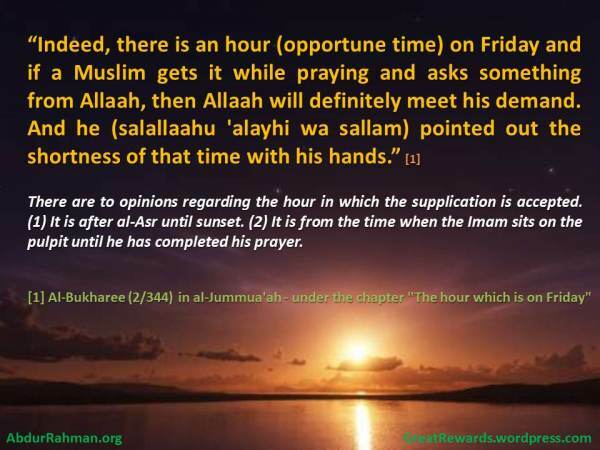 In Sunan Ibn Maajah (1139) it is narrated that ‘Abd-Allaah ibn Salaam said: I said, when the Messenger of Allaah (S) was sitting, We find in the Book of Allaah that on Friday there is an hour when no believing slave happens to pray and ask Allaah for anything at that time, but Allaah will meet his need. In Sunan Abi Dawood (1046), al-Tirmidhi (491) and al-Nasaa’i (1430) it is narrated from Abu Salamah ibn ‘Abd al-Rahmaan that Abu Hurayrah said: The Messenger of Allaah (peace and blessings of Allaah be upon him) said: “The best day on which the sun rises is Friday. On it Adam was created, on it he was sent down (to earth), on it his repentance was accepted, on it he died and on it the Hour will begin. There is no living being but it is in a state of apprehension on Friday from dawn until sunrise fearing the onset of the Hour, except jinn and mankind. On it there is an hour when no Muslim happens to pray and ask Allaah for what he needs, but He will give it to him. Ka’b said: Is that one day in every year? I said: No, it is every week. He said: Ka’b read the Tawraat (Torah) and said: The Prophet (peace and blessings of Allaah be upon him) spoke the truth. Abu Hurayrah said: Then I met ‘Abd-Allaah ibn Salaam and told him of my meeting with Ka’b, and ‘Abd-Allaah ibn Salaam said: I know which time it is. Abu Hurayrah said: I said to him: Tell me about it. ‘Abd-Allaah ibn Salaam said: It is the last hour of Friday. I said: How can it be the last hour of Friday when the Messenger of Allaah (peace and blessings of Allaah be upon him) said: “No Muslim happens to pray at that time,” but there is no prayer at that time. ‘Abd-Allaah ibn Salaam said: Didn’t the Messenger of Allaah (peace and blessings of Allaah be upon him) say: “Whoever sits waiting for the prayer is in a state of prayer until he prays”? I said: Then this is it. Al-Tirmidhi said: A saheeh hasan hadeeth. Some of it is mentioned in al-Saheehayn. [It was classed as saheeh by al-Albaani.] End quote from Zaad al-Ma’aad (1/376). According to the view that it is from the time when the imam sits down until the end of the prayer, that does not mean that the one who is praying behind the imam should distract himself with du’aa’ and not listen to the khutbah, rather he should listen to the khutbah and say ameen to the du’aa’ of the imam, and supplicate during his prayer, when prostrating and before the salaam. By doing so, he will have offered du’aa’ during this special time, and if he also says du’aa’ in the last hour after ‘Asr, that is even better. It’s one thing to talk during the khutbah. That’s absolutely wrong. But it’s different when you ask someone else to keep quiet while the khutbah is going on. That might seem right. But it’s wrong! For real for real.